Can an Irish elk beat a kangaroo? 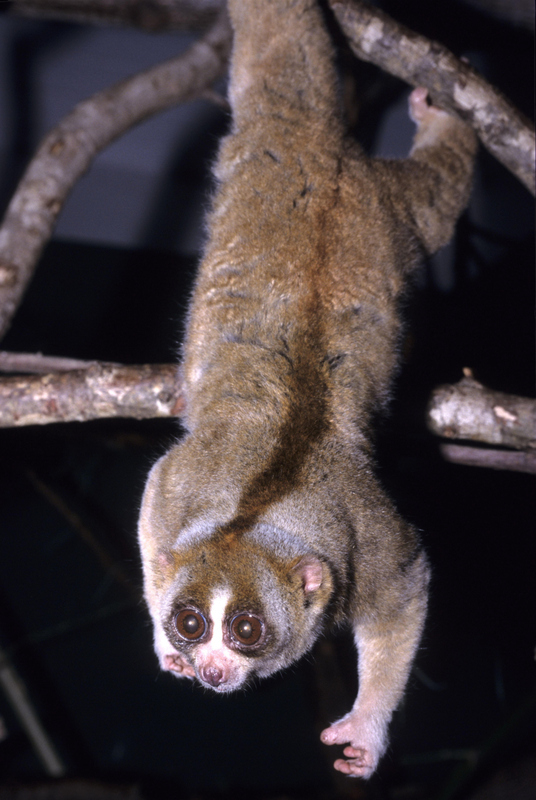 Can a Javan slow loris take an Iberian lynx? Do mythical animals have greater powers than real ones? 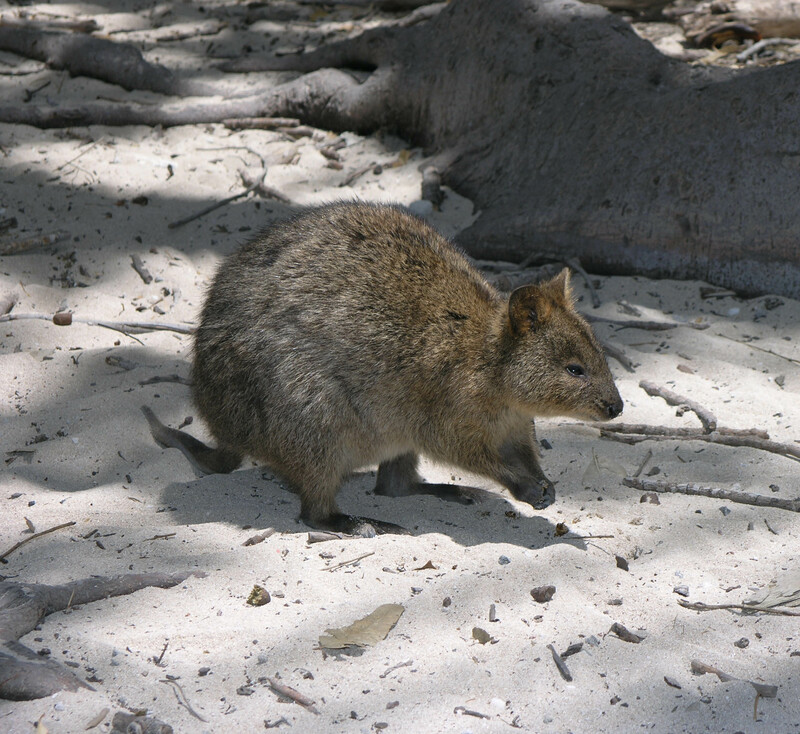 What the heck are quokkas and numbats anyway? Everyone who’s taking part in the 2015 MMM is right now finding the answers to those questions and more. 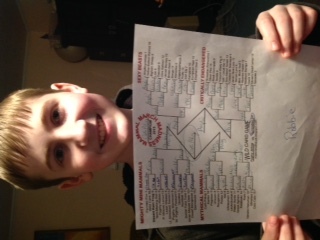 Mammal March Madness was founded just for fun by Harvard evolutionary biology professor Katie Hinde in 2013. It was more than fun. It completely took off. Now she and three colleagues research the animals and run the game. Just fill out your bracket, Tweet a pic of it, and then follow along on Twitter (#2105MMM) over the next three weeks, beginning at 8pm Monday March 9th, to see who wins each round. This will be my first year playing MMM. I’m teaming up with my teenage nephew Robbie who’s doing the research and making our picks. All set! It’s Cath Palug for the win! We’d really love it if family and friends joined us! For those not on Twitter let’s just hear your predictions here in the comments! Who’s going to reign as the 2015 MMM winner? Here’s the 2015 Bracket. Click to open the full-size and then download it. 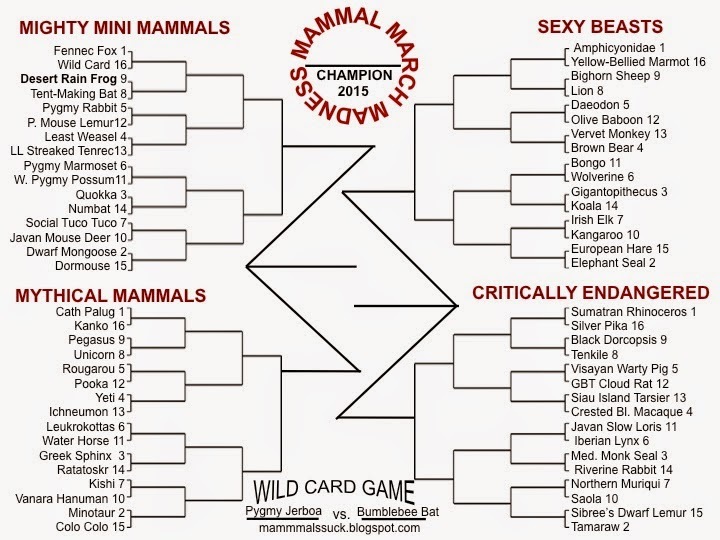 The MMM Team will live tweet the battles in the evening (~8PM Eastern, #2015MMM) and then the storify will be posted here. Their commentary and the #2015MMM Twitter feed will be filled with animal facts, surprise twists and no shortage of humor. Battle outcome is a function of the two species’ attributes within the battle environment. Attributes considered in calculating battle outcome include temperament, weaponry, armor, body mass, fight style, and other fun facts that are relevant to the outcome. Early rounds, the battle occurs in the better-ranked species’ habitat (home court advantage). BUT once we get to the ELITE EIGHT, battle location will be random: forest, semi-arid desert, intertidal zone, or snowy tundra.